Daphne bushes are a strong, survivor type of shrub and a great addition to quickly add color to a new bed. A few years ago I discovered a small bush growing in among the trees at the edge of out property. It was spring and it was covered with bright pink flowers that from some directions seemed to have a sort of bluish tinge. They looked like a ministure lilac but covered with blooms. 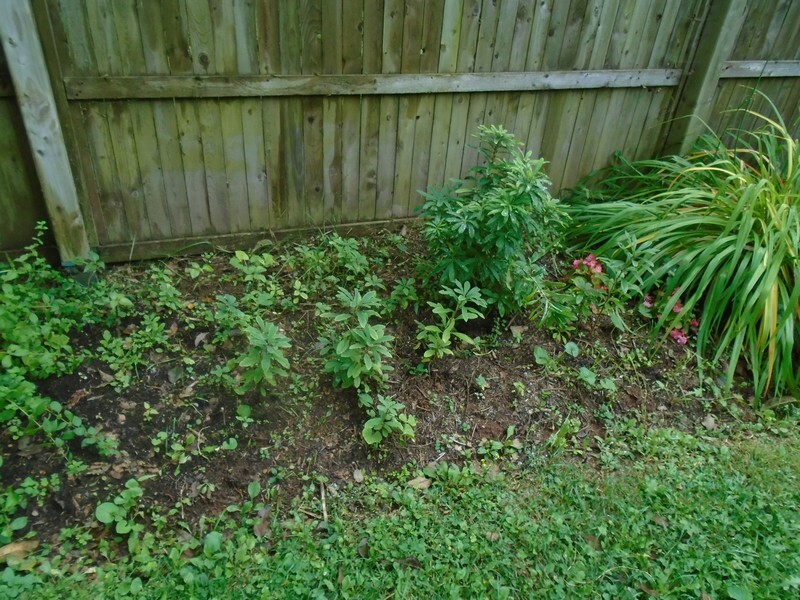 they also looked quite out of place so I moved them to the bed along the privacy fence I put up when my neighbours opened up the property beside us by cutting down the trees and putting up a horse run. No complaints; they are great neighbors and nice horses. I have since found that these are likely daphne bushes and a beauty ot have around. They get to about three feet high and form a ball shape quite naturally. In spring they cover with blossoms followed by lovely green foliage and dark berries. They also seed and spread well. 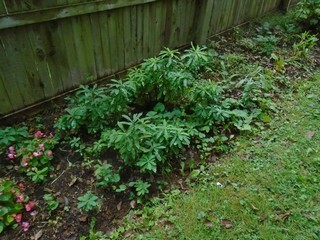 It seems I have an impromptu daphne nursery and some of these will move to fill in the shrub bed. 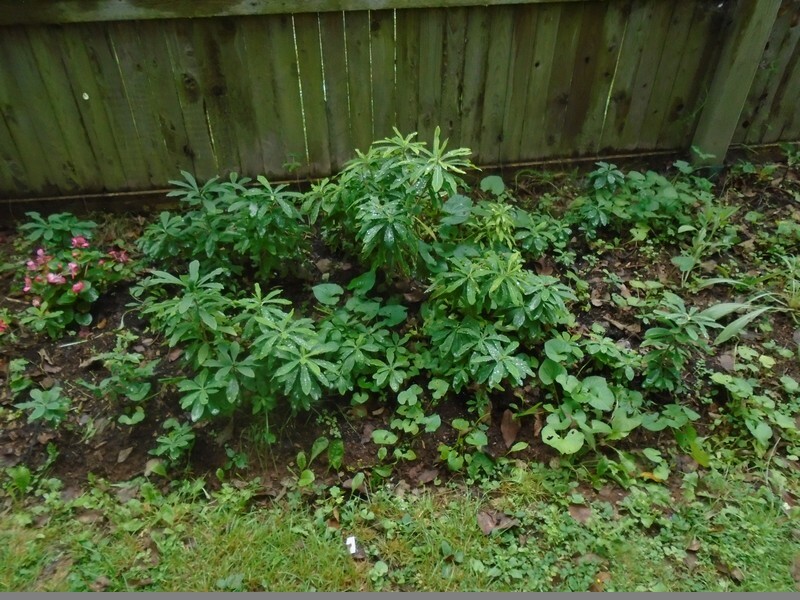 For that matter, since I had moved both bushes to the fence, about six feet further west along the fence is another nursery. 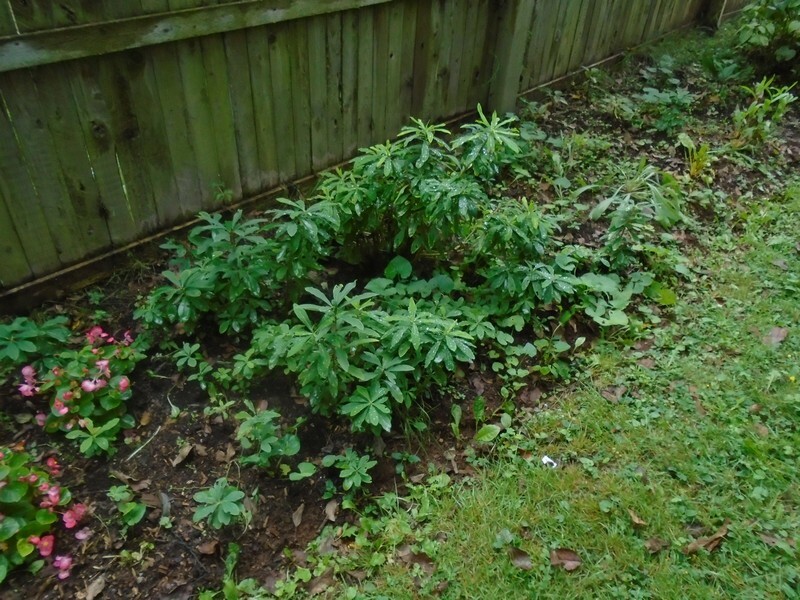 The two larger and older bushes took a beating in a ice storm last year and I pruned them hard to remove the damage. They are doing extremely well. 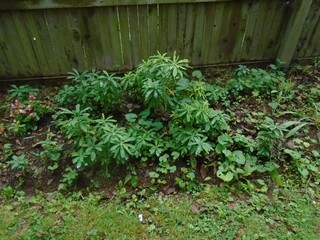 This is the same plant from another view and you can see how the young ones have grown around the mother. The oldest are wbout two years old. You can see the slightly softer green on the new growth of the mother plant here. 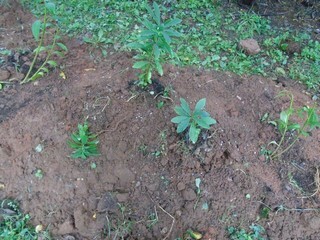 Here is the other planting. These plants have not spread as much as the first but they are still supplying a lot of stock as more shrubs will be needed around the yard. What I have found in the past is these plants do not develop a heavy root system when young and transplant easily. 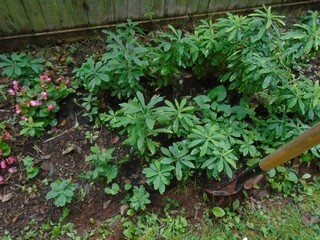 In fact, if you stick a branch in the ground and keep it watered it will root in a couple of weeks and grow on. 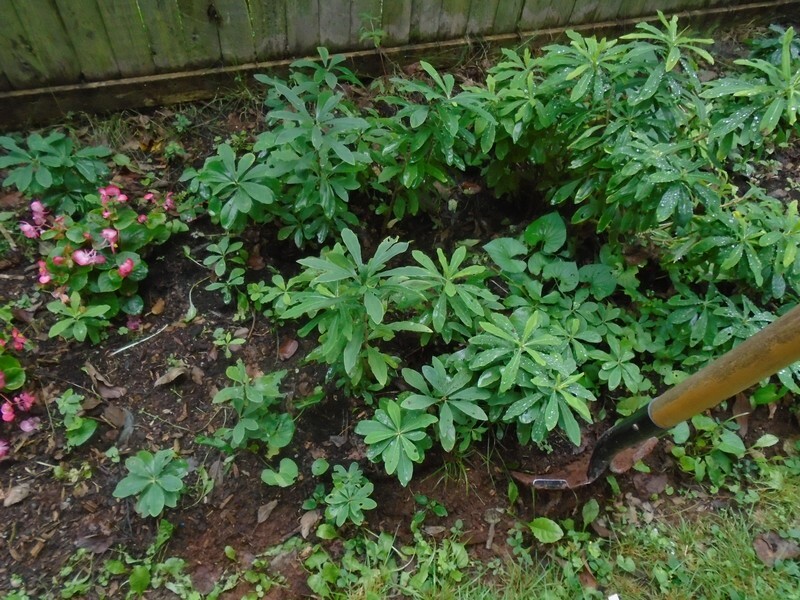 So I start by sticking a shovel in the ground and levering to loosten the plants. Even though I try to keep a root ball, these just pop out for moving. So I move them like bare root stock. 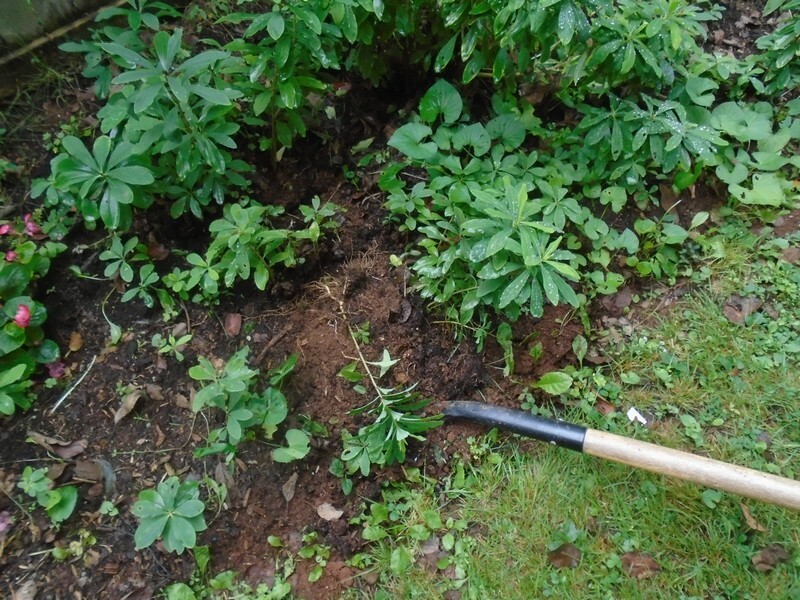 To plant bare root stock I just drive the shovel straight in for about 8 inches, pull it forward to lever a slit, stick the roots in and draw out the shovel. 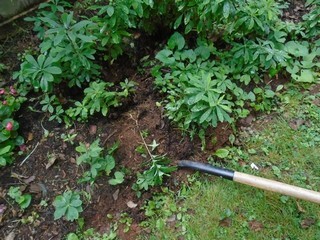 Then I firm the ground around the roots and water it in. One spring several years and many arthritic joints ago, I planted 15,000 (yes fifteen thousand) fir trees as a commercial Christmas tree grower in this fashion except I counted on the rain to water them in. It works well.